One Naira used to be two dollars about three decades ago. Today, it is 1 dollar to 400 naira, check the % devaluation. This is what corruption causes. When the people in power begin to loot and loot and loot with impunity and simply borrow foreign currency and print more money and loot. 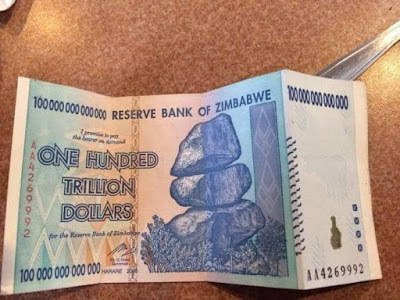 Zimbabwe has no oil, was under sanctions so no one could lend to her so printing was the only resort. But with abundance of oil, Nigeria isn't under any sanctions, it is looting. Okay tell my how much it exchanges where you live. When I saw this, I said it was a lie till I googled it. Seriously! This means that 500,000 Nigeria money can build a house over there. Schooling there will make sense wella. Please do they have good universities? The currency no get weight, but the paper get weight sha ! This must be early April move....? Then and again, that is poverty on another realm.